I love the beach. We have it very near our house, so we go there almost every day. 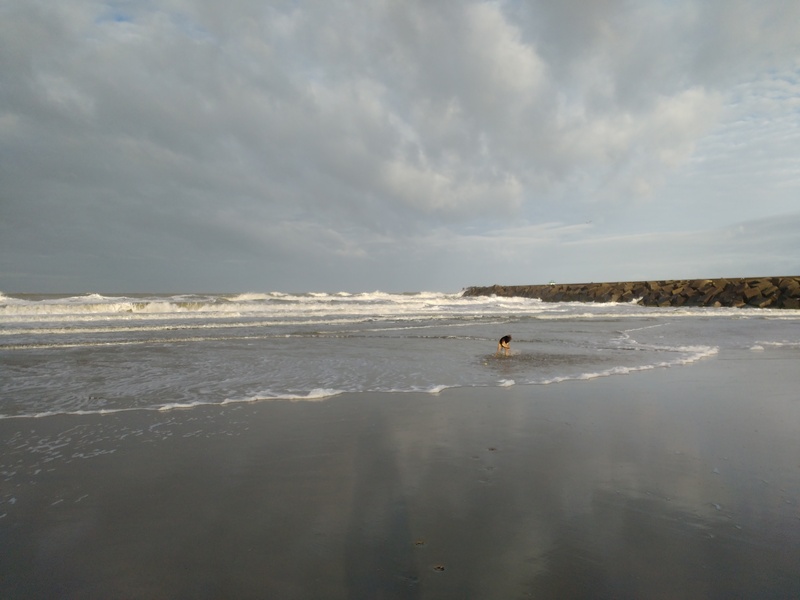 I love the spaciousness of it, I love sensing the silky sand underneath my feet, how soft it is and yet hard enough to give me a solid grip when I press my feet down to jump really high. I love the fresh water of the ocean to cool me down after some thorough running. There are a lot of things I love to do on the beach. Like running, playing with other dogs, digging deep holes and fetching ball. When I am lucky there are seagulls for chasing. When I am even more lucky, there are funny little birds I do not know the name of. They are small, like little balls, they have very short legs but they can run so fast one does not see the legs anymore. Of course I am faster. Too bad they can fly. No matter what the weather is like: the beach is always the best place to go. 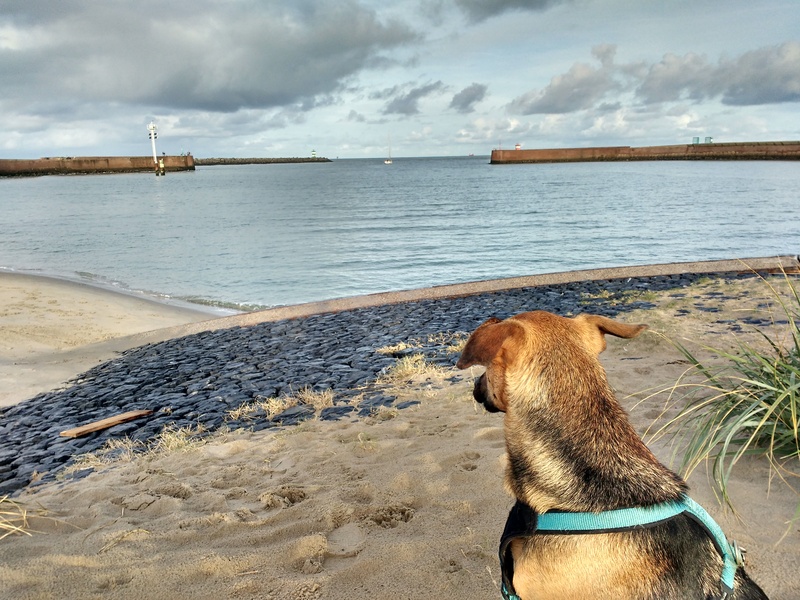 We walked to the small beach near the jetty, which is a great place for investigating. It has nice views, too. 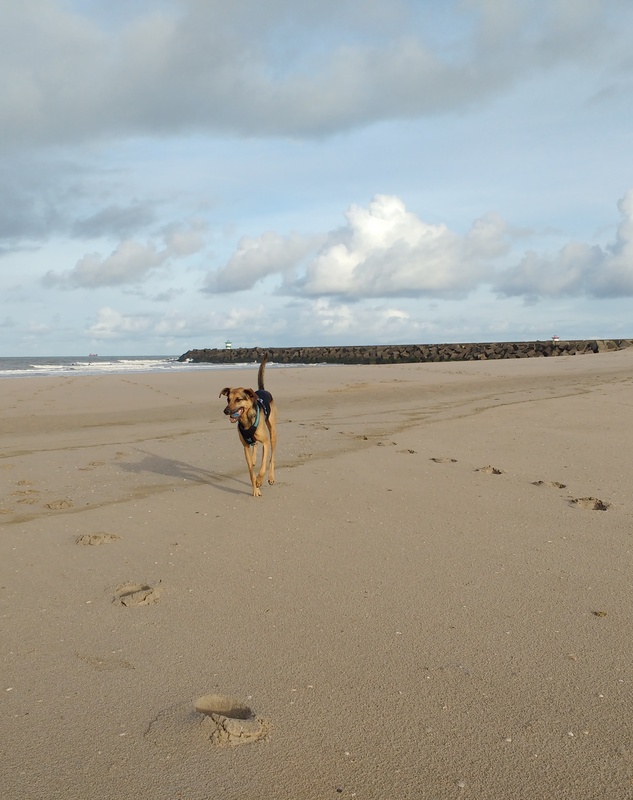 Then we went to the big beach, where I did some relaxed running. 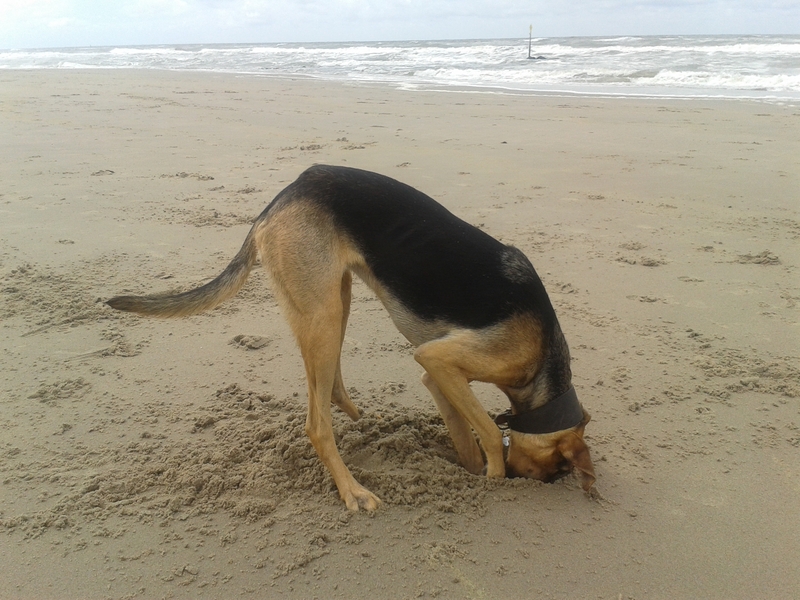 And made an effort in digging a huge hole for my brand new squeaky ball. 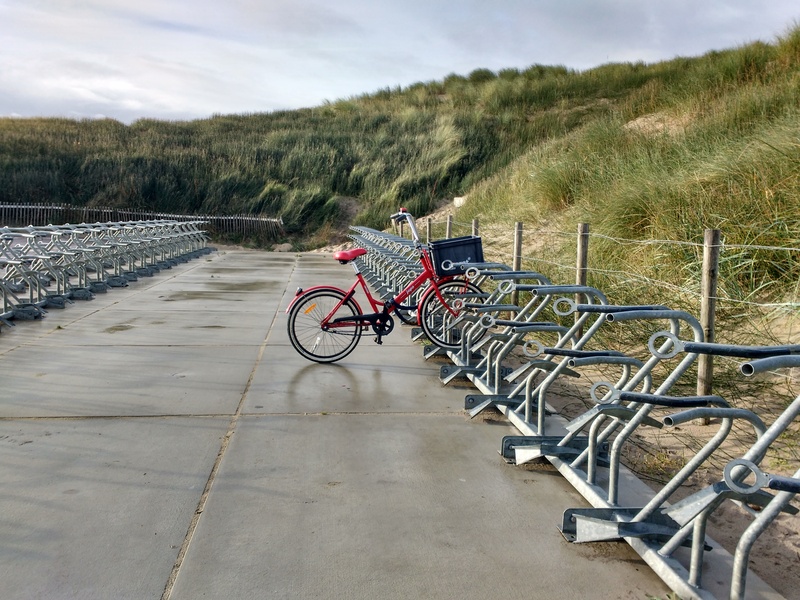 Then we went back home, M biking and me running. She is working now and I doze in my favorite chair. What a great way to start the day. Most days are good, but some days are even better. 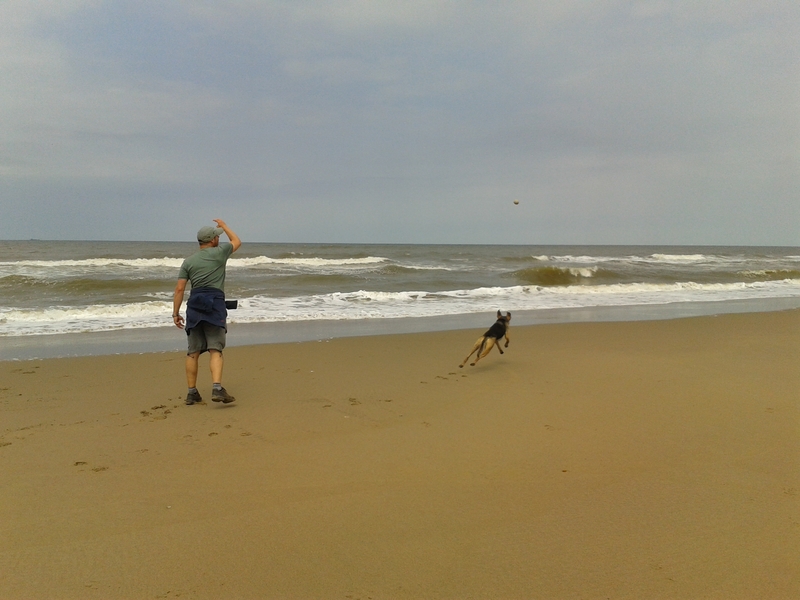 I was on the beach, fetching ball. 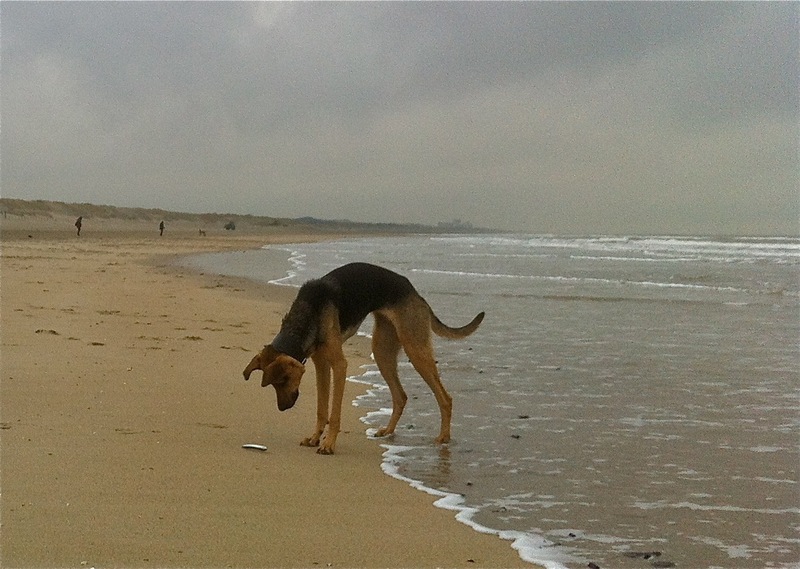 However, after a while we came to a part of the beach with loads of nice smelly things. Of course I had to discover what it was – it turned out to be a few crabs, already eaten alas, and one dead fish. Anyway I lost focus on the ball and another dog took it. I didn’t mind, really, because at that moment I found the fish more alluring. But humans tend to attach to stuff, including balls. I witnessed some angry argument between two humans earlier, because the dog of one of them had stolen the ball of the other dog. Not M, mind you, she won’t get angry over something trivial like that. She has no need: we possess loads of balls, because I find a lot of them for her. The human of the dog who stole my ball, however, did not know this. Apparently his dog steals balls often, because this human immediately came up with a clever solution: he offered another ball to M. M accepted graciously. After a while, when I had lost my interest in the fish, she threw it for me. When I caught it, I had a most wonderful surprise. It was a squeaky ball! My favorite! What a great trade-in. Lucky me! Most dogs love to fetch balls. I have been thinking about this – I like it too, I like it a lot, but why? Sometimes I muse about things like this, when I am snoozing in my favorite chair. When we dogs fetch balls, we experience a lot of different emotions and feelings. First there is anticipation. The human takes the ball into its hand and we focus on that: we see the ball, we know what is coming, we feel our muscles straining, ready for action. 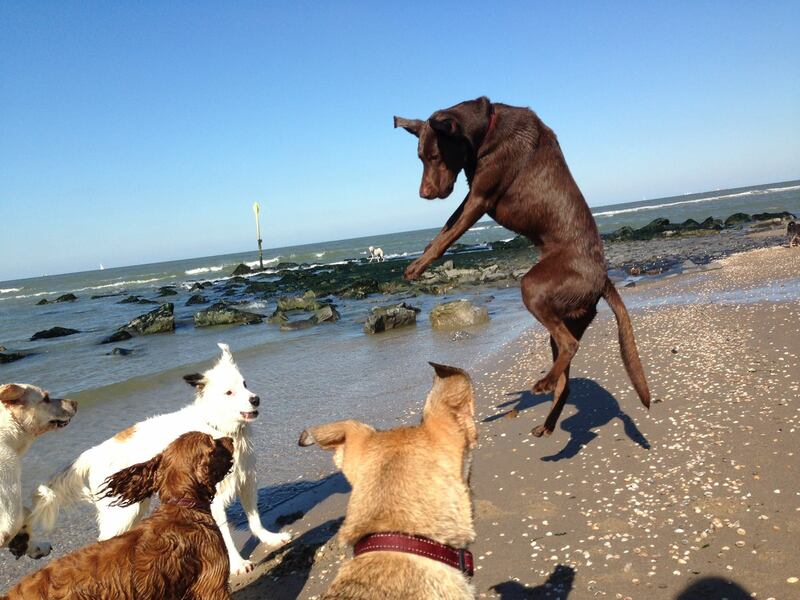 It is the sheer joy of knowing a human will throw a ball for us. Then the moment is there: the ball leaves the hand of the human and flies through the air. This is when we start running, but not at full speed immediately. At least, that is how I do it. I run and look at the ball at the same time. I make sure I follow the orbit of the ball, adjusting my speed to the speed of the ball. While running, I calculate where it will come down. I enjoy the wind on my coat and in my ears, I feel the ground under my feet, I spread my toes for optimal balance and power. I experience all these sensations at the same time, which makes it thrilling. When I have figured out where the ball will land, I accelerate. I love to use all the strong muscles in my body. I race towards the spot where the ball comes down, because I want to catch it before it hits the ground. 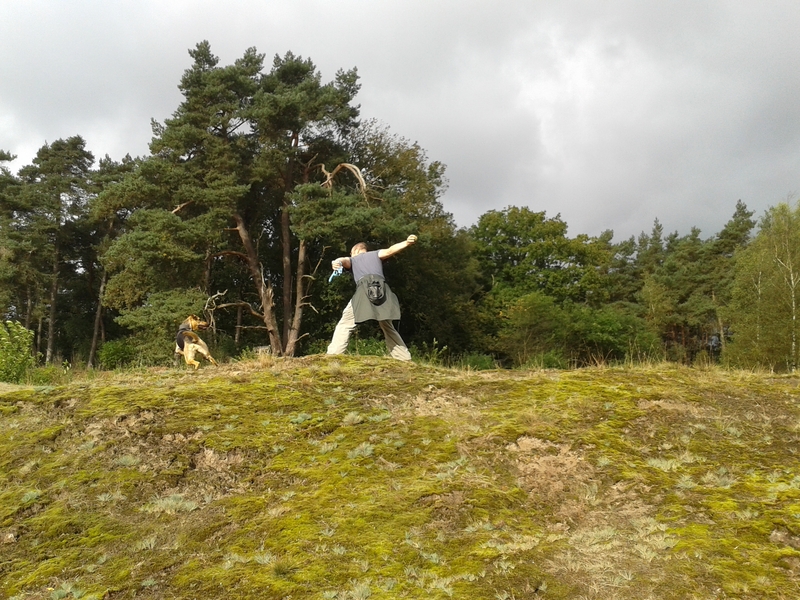 I am most peculiar about this: the best way to do ball-fetching is catching it in the air. I want to do the same with pigeons, but so far they are flying too high – pity. I stretch my long legs and jump. Then, when I have catched the ball, another part of the play begins. My muscles relax a little, because full speed is not required anymore. 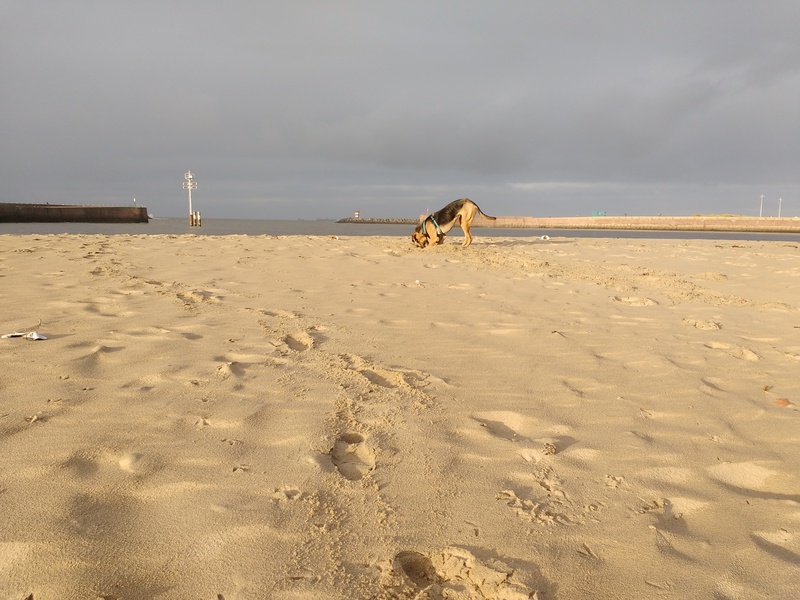 I feel the gritty texture of the ball in my mouth – mostly we play this game on the beach, so there is always some sand involved. I turn around and face my human and I start running back to her, fast but not too fast. 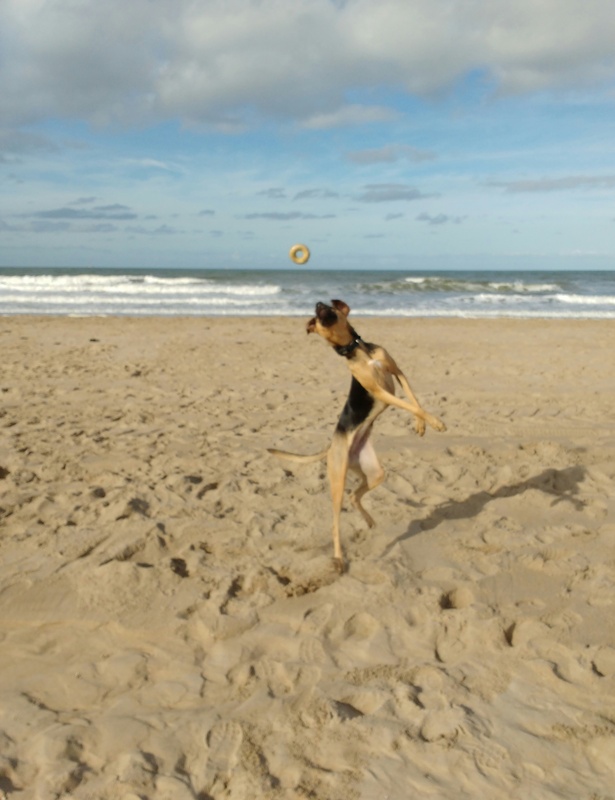 This is the moment when I enjoy the feeling of fulfillment: I have got the ball, I catched it flying, it is totally mine. 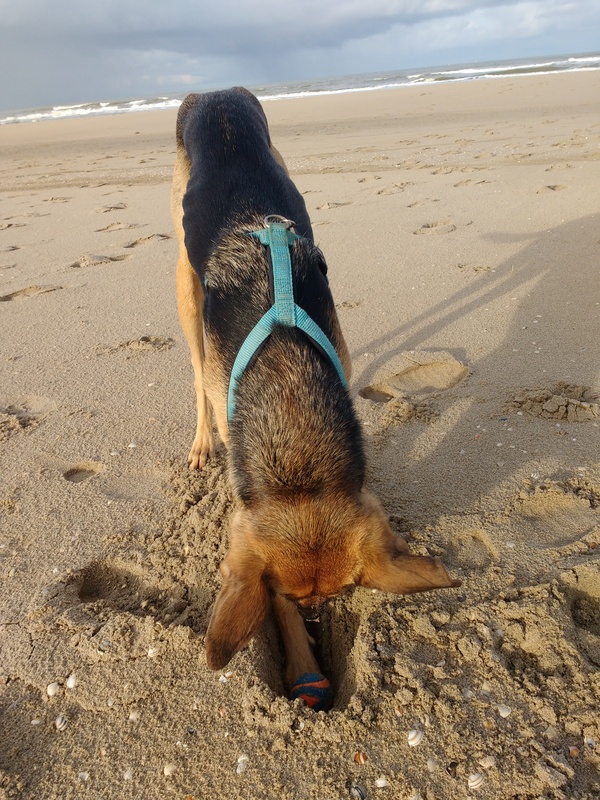 Sometimes I savour this moment a bit longer, by digging a hole and burying the ball in it. Then I take it out and bring it back to my human. And we start all over again (that is why I bring it back)! All this: the anticipation, the speed, the part where we need to calculate which way the ball is going, the joy of catching it… all this is why we love to fetch balls. We just returned from the beach and it was awesome. It has been storming all night, so the sea was rough and the air was clean. I did not meet any friends, M and I were alone. So we played ball and I ran. 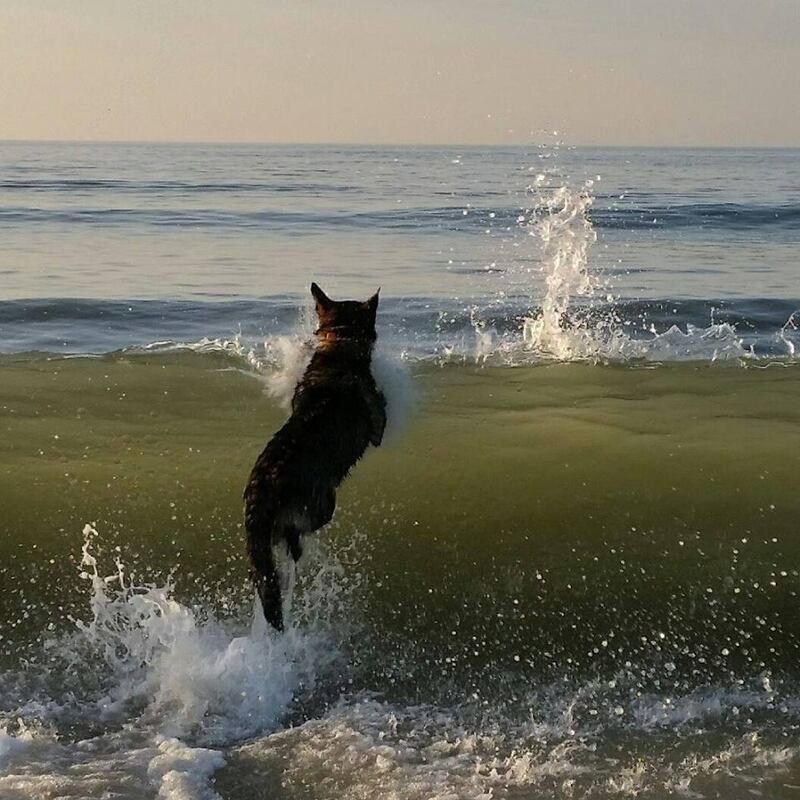 Every dog loves the beach. The space, the vastness… no matter rain or sunshine or storm, it is always very nice to be there. Running on the beach is a great way to start the day! I had a great morning. The sun was shining, it was as warm as springtime. Although of course it is autumn, the air smells of old leaves and earth. We went to the beach and P and M threw ball for me. My favorite ball, the one with a hole in the middle. Great for catching. 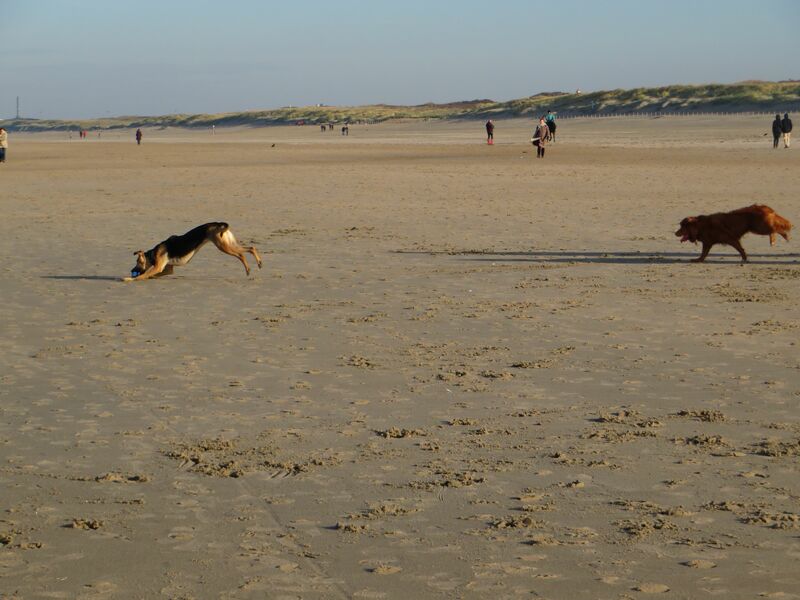 I am not only the fastest dog on the beach; I can jump pretty high, too. I just stretch my long body and push myself with my hind legs, up. Easy.